Blue Ridge Energy and North Carolina’s Electric Cooperatives each recently received a Spotlight on Excellence Award from the National Rural Electric Cooperative Association (NRECA), recognizing outstanding work in cooperative communications. The awards are an initiative of the Council of Rural Electric Communicators and represent NRECA’s highest communication honor. Blue Ridge Energy received a Gold Award for Best Total Communication Program in recognition of work done through its “Community Solar Sellout” campaign. Based on member requests for more renewable energy options as well as Cooperative Difference research showing strong member interest in community solar, last year Blue Ridge Energy implemented a community solar program across its service area and made it available to any member for an affordable monthly subscription. “Timing was perfect as the cooperative was coming off a rebranding initiative to position Blue Ridge Energy as its members’ trusted energy advisor for innovative energy options,” said Blue Ridge Energy Director of Public Relations Renee Whitener. The communications team used every available channel to keep community solar on the forefront of members’ minds throughout the year. Carolina Country cover wraps, member newsletters, website resources and sign up page, social media, Telephone Town Hall member discussions, the annual report, news media, videos, community presentations and employee communication were instrumental in the success of Blue Ridge Energy’s communications efforts. Nearing the end of the campaign, targeted direct mail letters and digital ads were also used to help completely subscribe all panels and designated energy advisors were key to signing up members and fully subscribing all four solar gardens. “Efforts were so successful that we ended the campaign with a waiting list and plans to build the cooperative’s fifth community solar garden in 2018,” Whitener said. 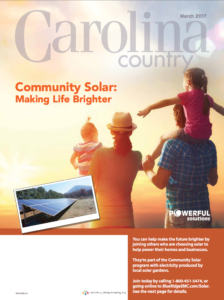 Carolina Country cover wraps were a part of Blue Ridge Energy’s community solar campaign. North Carolina’s Electric Cooperatives’ Empower video ads received a Gold award for Most Innovative Use of Digital Communication. Kristie Aldridge and Lindsey Listrom from the Statewide Corporate Communication group worked in partnership with a member advisory committee to create the videos, which are part of a larger digital initiative to connect co-op members with the specific services and tools from their co-op that allow them to control their home energy use. Sample videos can be seen online. There are two versions, one featuring a multitasking mom, the other a DIY dad. Each video was branded by co-op and advertised to that co-op’s members. Spotlight Award winners be recognized at NRECA’s Connect conference, held next month in Salt Lake City. This year’s Spotlight Awards received 770 entries. Gold Award winners are required to score at least 90 points out of a total 106. 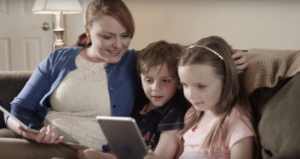 One of the Empower videos features a multitasking mom at home with her family.